Could this be the new Australian flag? Could we be tossing out the Union Jack for the Southern Horizon as our new Australian flag after a survey of 8000 people conducted by Western Sydney University's Dr. Benjamin T Jones? THE RESULTS of my Alternative Australian Flag Poll are in. We ended up with over 8000 participants with widespread media coverage so I'm very pleased with the response. The most popular design, the Southern Horizon, was designed by a media-shy recluse but has been embraced by a growing band of passionate supporters. Now research from the Institute for Culture and Society at Western Sydney University suggests Southern Horizon is the design most likely to successfully challenge the current flag. Between 16 December and 25 January, over 8000 people took part in the Alternative Australian Flag Survey. The purpose was to gather attitudes and opinions about this national symbol and to understand how Australians want to be represented. The success of the Southern Horizon flag mirrors the preliminary flag vote in New Zealand where the Silver Fern was the most popular design. The Silver Fern is a minimal change design. It maintains the red stars on a blue background but replaces the Union Jack with the distinctive plant and the black and white made famous by the All Blacks. Southern Horizon is also a minimal change design. 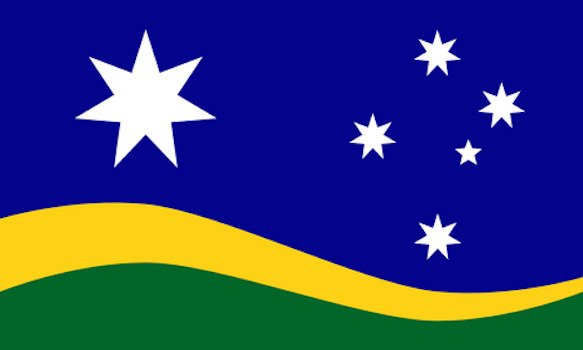 It maintains a white Southern Cross on a blue background but includes the national colours of green and yellow in a unique wave. Significantly, the Federation Star is raised to the upper hoist (top left). In vexillology, the upper hoist indicates whose command a ship is under. While the current flag suggests Australia is still a dominion of Britain, Southern Horizon asserts Australia’s people and democratic system are the ultimate power. While Southern Horizon was the most popular design, it was closely followed by Dr John Blaxland’s Reconciliation Flag. The survey suggests there are two main schools of thought regarding a new flag. One camp suggests the flag must be simple and neutral with no group singled out in order to be representative of all Australians. The other camp argues that Indigenous Australians must be specifically recognised in a new flag. Dr Blaxland’s flag was criticised by some – included some who voted for it – for being too complex. It contains six different colours and an intricate dot design to recreate a Federation Star. The survey suggests that a simplified version of the Reconciliation Flag with fewer colours and a solid yellow Federation Star would poll better. Popularity of alternative designs. N.B percentages results have been rounded, remaining 1% is shared among several designs. The Eureka Flag polled strongly and was the third most popular choice. It is the first flag to be called the Australian Flag and is championed by prominent writer and Chair of the Australian Republican Movement, Peter Fitzsimons. In some ways Eureka with its historical significance and popular mythology is an obvious choice. The original flag from 1854 is preserved in the Museum of Australian Democracy at Ballarat. The flag and the Stockade has been hailed in a recent book as Australia’s Greatest Story and the 3 December anniversary could provide a much needed alternative to the hugely problematic 26 January for Australia Day. For all of Eureka’s virtues, many participants felt it was too strongly associated with either militant unionism or extreme right-wing groups. The Golden Wattle design, Sporting flag and Southern Cross polled worst and were frequently criticised for being boring. One of the other frequent comments, however, was that the design should be simple. There is clearly a delicate balance to strike between being too simple and too complex. The survey suggests that Southern Horizon with three elements and four colours is closest to getting that balance right. If Australia is to adopt a new flag, it must be championed by prominent politicians. The New Zealand vote was made possible by the tireless campaigning of a conservative prime minister, John Keys. A government-guided process to look extensively at various flag designs followed by a non-compulsory democratic vote to choose an alternative design would be the fairest way to find a worthy alternative. One crucial question is whether strong supporters of the various losing flag designs would be willing to support the winner. The survey received mixed responses. Many responded that they would support any design without the Union Jack but others were more selective. There is a great power in incumbency and those who do not feel strongly one way or the other will likely support the status quo. For any flag referendum to be successful, all supporters of change must unite behind the most popular design. Australia stands as one of the only nations to celebrate its colonial past rather than its independence. Like the republic, the issue of a new Australian flag will not go away until it is finally addressed. A flag is just a piece of cloth but it is infused with meaning. Australia deserves a flag that represents the vibrant, independent nation we are, not the loyal dominion we were. Dr Benjamin T. Jones displays the winning design of the Alternative Australian Flag Survey. Dr Benjamin T. Jones is an adjunct fellow at the School of Humanities and Communication Arts at the University of Western Sydney. You can follow Dr Jones on Twitter @BenjaminTJones1 or on his blog, Thematic Musings. Support democracy. Subscribe to IA for just $5. Where does Mark Latham sit among Labor rats? Does Australia Day commemorate genocide?